Wet an S.O.S pad with water and use to clean soiled surface. Rinse area clean with clear water. Just as safe on cookware as regular soap pads. Use of gloves may reduce skin abrasion. After use, either discard pad in trash or rinse pad with water to remove dirt particles, gently squeeze to wring out excess moisture and store on a clean, dry surface. 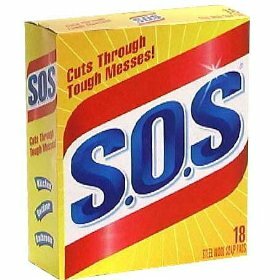 For delicate surfaces, test first by lightly using the S.O.S pad on a small, inconspicuous area. Geeked Out and Caffeinated - That's us. We're coffee nerds and proud of it. We get all fired up on method and process. And even though it's not rocket science, there's enough experimentation behind our cold brew to drive normal people crazy. Because that's how we like it. For us, good enough is never good enough. We're always curious about doing things better?and endlessly patient when it comes to doing things right.We're on it.Stokabulary -Cafobia: (n.) Fear of risking one's morning ritual on an unknown coffee shop. Stok Unsweet Black Cold-Brew Iced Coffee 48oz. is Brewed Low & Slow. More Beans. We brew our Arabica-based blend using a higher ratio of coffee beans to water than typical hot brewing. Time & Patience, Not Heat. Hot brewing forces the flavor from the bean. But cold brew takes its sweet time. So we steep for at least 10 hours at lower temperatures to bring out every drop of smooth, bold, one-of-a-kind Stokness. Great Coffee Speaks for Itself. Caffeine free. Artificially and naturally flavored. Contains no juice. Caffeine free/very low sodium. How's this for a sweet deal? Pure, rich cola taste, zero calories, and Splenda for sweetness. Diet Rite Cola is the diet soft drink done right - er, Rite. Take a refreshing swig of Diet Rite Cola and savor your moment of living Rite. 100% Vitamin C. Contains 5% fruit juice. Non-carbonated. Caffeine free. Artificially flavored. Fruit pulp. La Croix Grapefruit Sparkling Water.100% Natural.Calorie free.Sweetener free.Sodium free.